Billionaire philanthropist David Rockefeller has died in his sleep at his home in Poncantico Hills, New York, a spokesman said. He was 101 years old. Mr Rockefeller, the last of his generation in the famed American family, was the grandson of Standard Oil co-founder John D Rockefeller. The centenarian was at the helm of his family’s fortune, controlling both philanthropic and business interests. He was the youngest of five sons of John D Rockefeller Jr. Though he never sought political office, he had two brothers who served in government. Nelson Rockefeller served as governor of New York and briefly as US vice-president while Winthrop Rockefeller was the governor of Arkansas. 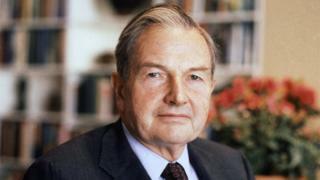 David Rockefeller graduated from Harvard in 1936 and received a doctorate in economics from the University of Chicago in 1940. He then served in the army World War Two before working at Chase Bank, which later became JP Morgan Chase. He was named president of the company in 1961 and chairman and chief executive in 1969. The renowned capitalist supported the assistance of economies abroad, arguing that it would create customers for American products. Under his leadership, Chase was the first US bank to open offices in the Soviet Union and China. Mr Rockefeller retired in 1981 aged 65. Former President George HW Bush and his wife, Barbara, released a statement saying they were “deeply saddened” by the passing of their “wonderful friend”. “So many knew him as one of the most generous philanthropists – and brightest Points of Light – whose caring and commitment to the widest range of worthy causes touched and lifted innumerable lives,” the statement read. The couple added that they would “surely miss” their annual visits with him in Maine. Mr Rockefeller was also remembered for his patronage to philanthropy and the arts, preserving his family’s close relationship with the Museum of Modern Art. His private art collection was once valued at $500m (£404m). On his 100th birthday in 2015, he donated 1,000 acres of land next to a national park to the state of Maine. His charitable service earned him a Presidential Medal of Freedom, the country’s highest civilian honour, in 1998. He had six children – David Jr, Richard, Abby, Neva, Margaret and Eileen – with his wife Margaret (nee McGrath). She died in 1996.